Can we change the army into anything we could trust? The following was written in response to a debate in my CLP around a possible submission to the Labour Party 2014 Policy Review on the issue of defence. In it I talk about things we might do to have a democratic accountable army. It is a speculative exercise and doesn’t address how we might get from now to then. For that we would have to take into account this famous quote from Marx and Engels in their 1872 Introduction to the Communist Manifesto. What is the good of an army? If there was a competent group of people who could be moved to places where horrible things were going on and help the people there get rid of tyrants and tyrannical movements. That would be good, wouldn’t it? That’s the reason many people feel they should support ‘their’ army’s interventions. They think it is ‘theirs’ because there is a kid down the road who joined up – or a family member – their lives are at risk, they want to support them. Very rarely do they support the army because they want to see brutal racist actions to be committed against other nationalities and that is why anti-war activists shouting ‘imperialism’ does not effectively answer them. Although there are often imperialist drum-beaters promoting intervention in press and parliament and awareness of their general political cynicism can change a supporter of intervention to an opponent. Those of us on the left can get an understanding of why many people support military intervention if you think of some very large and well organised International Brigade being created. That would be a good army wouldn’t it? Ironically ISIS has shown how successful a reactionary version of that model, of an international politically driven volunteer force, can be. But what is the good of an army – if in most places where you might want to send it, it has such a terrible record that everyone thinks its very presence would be counter-productive? That’s no good, is it? That’s the problem of the UK army, even more so the US Army. Before the UK could have an army that could be trusted, it would have to be root-and-branch transformed. Part of that would have to be a historical accounting. A lot of apologies and admissions of guilt from politicians and heads of the Armed Forces to those who have suffered – and not only to the families and to the injured and killed soldiers of ‘our’ side. An apology, first of all, for the invasion of Iraq in 2003. Those apologies would need to be heard not only by the citizens of the Middle East but also Northern Ireland, Kenya and Greece. It would need to be heard by us – before we could ever risk an Army acting in our name. 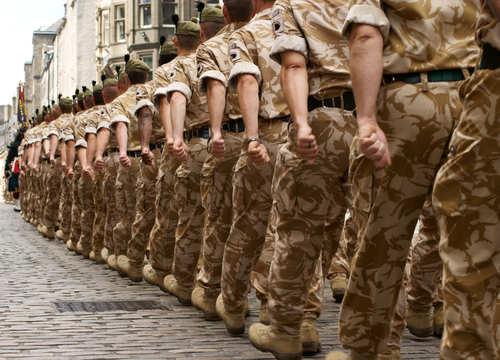 Soldiers should not be recruited from the dole queue – from people who just want a job or another chance of training. A job and training should be everyone’s right – without them having to join up. A democratic soldier should be recruited from amongst the most socially and democratically aware. We would have to recreate the training programme for soldiers – close the brutalising and bullying training in such places as Deepcut, which are replicated hundreds of times across our current army. The culture of unquestioning obedience would have to be changed. The spirit of debate and learning of soldiers would be encouraged – particularly on the international history of the fight for democracy throughout the world. They should have the right to join a union. The officers would not be separate from the democratic workers movement – they would be part of it and answerable to it as well as other democratic institutions – at every level. Overseas they would be as closely involved in the local community as they could be. Not just the wealthy middle class but the poor, the victimised minorities, the heart of any real movement for democratic change. Predictably in the Respecting the Armed Forces section of Labour’s 2014 Global policy review, like with the Front bench’s speeches, there are no apologies for the misuse of the Armed Forces in the past or criticisms of the structure of history of the armed forces. I wanted to add quite a bit of my views above to the current Labour Policy Review at my CLPs meeting last Wednesday but I couldn’t get it under 200 words. But more seriously the Party’s policy on defence and foreign policy is a real mess. Partly a legacy of the Blair years but also a long-term problem in the labour movement. Apart from occasional expressions of fury at some foreign policy outrages, we find our movement and our unions can usually only be moved to act on domestic issues – and only then after a great deal of effort. But imagine if transforming the army was to be an act of a future democratic government. We could have an army we could trust. It would be an instrument of organising democracy in solidarity with people facing repression. But the British Army, the RAF are not that now! As there is talk again about military intervention in Iraq and Syria – we need to be aware of this, as democrats overseas are usually aware. Whilst military aid is one thing, direct US/UK military intervention would not be under democratic control and would not intentionally lead to democracy in Iraq, Syria or anywhere else. We should not be advocating US or UK military intervention. But we should call for support for Iraqi, Syrian democrats, trade unions and non-sectarian forces. Any military action should be under their control and limited to what they think useful. This entry was posted in Labour on June 16, 2014 by Pete Radcliff. Please listen to this – it is worth it, There has been a lot of nonsense spoken about how China has changed since this massacre of the heroic Tiananmen protestors of 1989 – it hasn’t. There is a lot of nonsense about what they were fighting for – they weren’t fighting for capitalism – they have that. They were fighting for democracy – and there is little or no democracy in China. There are people still fighting for trade union rights, for housing rights, against huge inequality. They face huge repression. we have to find a way to support them. This entry was posted in Uncategorized on June 5, 2014 by Pete Radcliff.